I often hear from investors who love the Total Wealth approach, but are either just starting out or simply don’t have a lot of money to invest. The “Big A’s” – if you’ve never heard the term before – are what I call Apple Inc. (NasdaqGS:AAPL), Amazon.com Inc. (NasdaqGS:AMZN) and Alphabet Inc. (NasdaqGS:GOOGL). Frankly, it’d be very hard to go wrong with any of ’em over time, which is why I recommend positions in all three companies individually in my premium publication, the Money Map Report. Apple’s shares have risen more than 35% over the past 12 months while Amazon’s tacked on 25%. And, last but by no means least, Alphabet shares have appreciated 15%. The three are clearly competitors, and good ones at that. It doesn’t matter whether you’re talking mobile phones, smart devices, the Internet of Things, interactive households, media, or even Big Data – just to name a few product sets. They’ve all got serious potential. But, again, that’s not the question at hand. We’re here to talk about which ONE company I would pick if I had to buy “just” one. Here’s how to break the situation down. 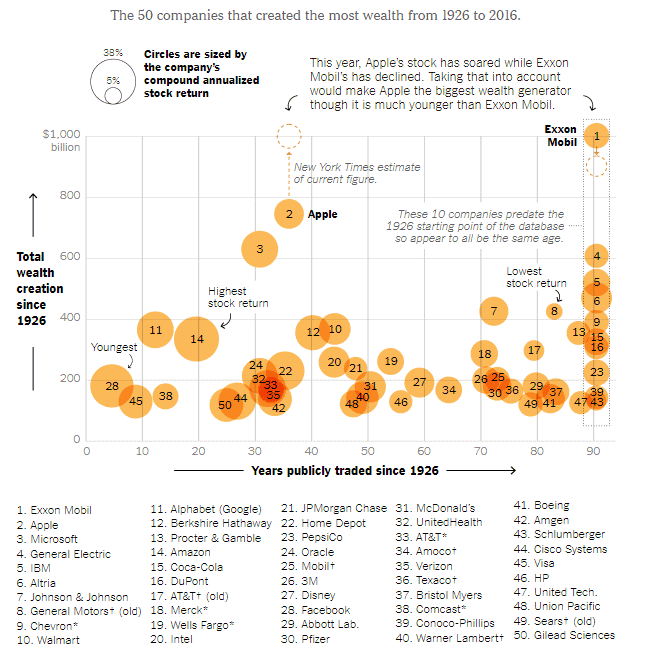 The first step in finding new wealth is to see which companies have produced it historically. The bigger the number, the better. That’s because any company that’s created huge amounts of wealth is unlikely to be abandoned even if the “you know what” hits the fan. Apple’s the undisputed winner by this metric by virtue of the fact that the company has created an estimated $1 trillion in wealth. In fact, Apple has created more wealth for investors than any other single stock since 1926, according to finance professor Hendrik Bessembinder of Arizona State University’s W.P. Carey School of Business. Interestingly, Amazon and Alphabet aren’t far behind despite the fact that they’re both much younger companies. Alphabet comes in at 11th while Amazon is 14th. A glance at the pace of revenue generation tells you a lot. Here, Amazon comes out on top, with revenue growth of 1,169.6% between 2006 and 2016. That’s compared to 1,016.4% and 751.2% from Apple and Alphabet, respectively. What I’m looking for here is simply the speed at which a given company is pulling in money. Next, it’s important to think about what a company will become, rather than what they’ve been. That way you’ll have a vision with regard to what’s possible instead of just what’s happened, which is how most investors miss the boat time and again – especially when it comes to life-altering wealth potential. For example, millions of investors still think about Apple as a device company, which is why they can’t wait to latch on to the next iPhone, watch, or Siri speaker. They are completely missing the fact that Apple is a company in transition. The Apple of the future is all about services, apps, and the ecosphere – meaning surrounding your life with Apple products driven by Apple code. [DON’T MISS] The Mother Lode of this new fuel found in U.S. (it’s not oil) Learn more here. Apple services, for example, now account for approximately $7.3 billion in revenue, and that figure is growing by 25%-30% a year. To put that in context, the services unit is potentially the size of a Fortune 100 company all by itself – something CEO Tim Cook noted during the company’s most recent earnings call on August 1, 2017. Amazon, on the other hand, has very strong roots in retail and it’s obviously a primary contributor to the “Retail Ice Age” I told you was coming years ago. Not only would “mom & pop” stores be impacted, but Amazon’s very existence would force investors to rethink previously unassailable retailers like Sears Holding Corp. (NasdaqGS:SHLD), which were (and still are) among the most dangerous stocks you can own because of their potential to completely destroy an investment portfolio as they collapse. Amazon’s future is all about big data, big services, and the customer experience (which I’ll return to in a moment). Very few investors realize that Amazon’s web services now drive an estimated 70% of all global internet traffic worldwide, according to NextGov.com. Further, that Amazon’s cloud business drives 89% of the company’s consolidated operating income, according to Statista. Contrary to what a lot of investors believe, the Amazon of the future is not about shopping. Alphabet, on the other hand, began with a search engine and ad revenue, which is why the company remains locked in competition with any upstart trying to figure out what people are looking for and why. Going forward, though, Alphabet is about everything from self-driving cars to medical tech. Most investors rely on the Price to Earnings ratio because it’s a mainstay in “value investing” – meaning the practice of selecting stocks that are believed to be undervalued by the markets. When you hear conventional analysts talking about whether specific companies are “expensive” or comparatively “cheap” on your favorite financial shows, this is usually the metric they’re referring to at a specific moment in time. Incidentally, PE ratios have no predictive value whatsoever – so don’t get hung up on them. The far better measure, the PEG ratio, which stands for Price Earnings Growth ratio, or “peg” for short. The PEG measures the tradeoff between a stock’s price and the earnings generated per share, which makes it a far better reflection of what a company is worth over time. That means the PEG is more like a movie than the single snapshot that is the PE ratio. PEG ratios under 1 reflect a company that’s a good buy, while PEG ratios over 1 denote progressively expensive prices for an expected stream of earnings. Prioritizing companies with lower PEG ratios can help you “buy low and sell high” consistently because they ensure you’re not paying too much for any stock given earnings expectations. Right now Apple trades with a PEG ratio of 1.13 at while Amazon and Alphabet reflect PEG ratios of 4.63 and 1.83, respectively. What this tells you is that Amazon is the most expensive of the three and Apple is the least. Or, put another way, that Apple is the least expensive given expected performance. At this point in your analysis, you should be beginning to develop a pretty good understanding of what the company looks like going forward, which is why I suggest you also look at another ratio that most analysts overlook) to confirm your findings. That’s the Price to Sales ratio. The Prices to Sales is a representation of how efficiently a company is generating every dollar of sales. Generally speaking lower numbers are better because that means you’re paying less for every dollar of sales it generates. Here Amazon really starts to come into its own with a Price to Sales Ratio of 3.00 versus 3.54 from Apple and 6.48 from Alphabet. Legally speaking, all three companies are a dead heat because of significant pressure from regulators, legislators, and courts around the world. I’m not sure whether this is a temporary reaction to industry dominance, protectionism, or some sort of last ditch effort to rein in a longer term existential threat. In Europe, for example, there’s something called the General Data Protection Regulation. It’s a new data protection regime that gives EU citizens far-reaching control over their personal data, and specifically, the right to be forgotten. Penalties for noncompliance are up to 4% of a given offender’s global revenues. That means we’re talking about 4% of a staggering $90 billion to $215 billion to when it comes to Apple, Alphabet, and Amazon. That’s why if you have to place one bet and one bet alone, I believe you have to go with the one company that’s got the ability to redefine capitalism. You see, tomorrow’s investing potential is driven by companies that will change the very way we live. They’re not so much about making products or even producing data. Rather, they’re about connecting humanity. As such, they’re tapped into the six Unstoppable Trends we follow because of the trillions of dollars that will get spent on “must have” products and services they provide. That’s why if you have to buy just one stock of the three “Big A’s” I say you buy Amazon. Alphabet, meanwhile, is founder-centric, which suggests to me that its business will be tightly controlled by a very concentrated inner circle of people. The obvious counter to that is the incredibly diverse nature of everything the company’s working on, from big data to self-driving cars and more – and that’s a fair point. However, none of these things is worth a hill of beans until they are “broken” out from the proverbial mothership. The company is very much a mirror of Jeff Bezos’ personal belief system. To him, shareholder value is nothing more than a scorecard. What he really wants is industry leadership in every segment the company enters. Admittedly, at around $980 a share, Amazon is not cheap. Buying a single 100-share round lot will set you back nearly $100K, which is roughly equivalent to what it takes to pick up even a modest house these days. That’s why I’d urge you to consider buying a 26(f) fund like the T. Rowe Price Blue Chip Growth (TRBCX), which considers Amazon a primary holding. They give investors the opportunity to earn aggressive monthly income combined with huge lump-sum payouts. Get paid $2,000… $5,000… even more… every month for the rest of your life. Then still grab six figures in one shot. Either way, get on board. The way I see it, Amazon is the only company in the history of the stock market that has made earnings irrelevant by placing its customers above all else. Profits will inevitably follow over time. As a big user of Apple and Amazon I tend to,agree although I am looking closely at Alphabet. For 3 years have been disappointed with Apple products but the latest announcements have renewed my enthusiasm. As an 83 year old my prime interest is health and I have hope that the Apple Watch plus the iPhone X coupled with Artificial Intelligence is going to give me a smart advisor on my wrist..